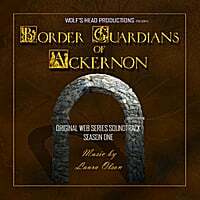 This long awaited album features epic orchestral and choral music from the popular fantasy online TVseries Border Guardians of Ackernon. Includes the bonus track "The Pert Have a New Emporer" from upcoming season two. 8. There's a Kid Out There! This long awaited album features epic orchestral and choral music from the hit fantasy webseries "Border Guardians of Ackernon". Included is the exclusive bonus track "The Pert Have a New Emporer" from upcoming season two. …the stage is set for what seems to be a pretty epic tale of drama and woe. I like it. The feel is significantly enhanced by an orchestral score that does a good job of relating the gravity of the situation. Border Guardians of Ackernon is a popular online TV series of a crossover fantasy genre about a group of camp counselors that are mysteriously whisked away into the world of Ackernon. Since before the Mage wars 400 years ago, the medieval Kingdom of Ackernon has been protected from their enemy, the Pert, by the Great Wall which has in turn been protected by Magic and the elite graduates of the University. Now, for unknown reasons, the wall is failing and the University is under attack from the very government they serve. Meanwhile, 5 camp counselors from Earth, armed only with their flashlights and smartphones suddenly find themselves on Ackernon and embroiled in the conflict. During a meeting with the mystical Dienstag Licht Arges, they each discover they have a path to follow and are somehow important to the outcome. The question is, are they all walking the same path and will they survive long enough to discover their role? Join the Sword Mistress Galiene and her former students, Roanue, Gayorg and Petrina as they attempt to unravel the mystery with the aid of the smuggler Vardin and the Reafan peddlers. The orchestral scoring shows heavy influences of Russian, middle eastern, Asian, and Medieval historical instrumentation as well as electronic styling which blends into a unique fusion of themes and support music. Every track is enjoyable for listening and stands well on its own apart from the visual drama. The score also makes use of an integrated excerpt from the Red Army Choir (Russia) for exciting fight music in the track "The Musky Ox". The tracks include from magically peaceful settings, intense and dark drama, death scenes, romantic music for love scenes, wild chases across the countryside, lonely, spiritual, scary, mysterious as well as musical settings for skirmishes and battles. This album would be a great score to listen to while gaming or just food for your imagination! Laura Olson is the owner of Blue Steer Studios, a public school music teacher with over 20 years of experience and holds an M.A. degree in Irish Traditional Music Performance. Her music is an interesting fusion of electronic, orchestral, and ethnic instruments. Previous albums and projects include “Mossflower Country: inspired by the tales of Redwall” which she humorously describes as “a movie score without the movie” and “Over the Fence in the Land of Oz” a short film inspired by the association of the U.S. Special Forces with the Hmong people in Laos during Vietnam. Her newest album for future release is about dogs in legend and mythology set in electronic dance forms like trance, techno, and ambient chillout. I listened to the songs on this track and I couldn't resist. The songs were just amazing and the beats and instruments were brilliantly orchestrated; it was like I could feel the music. Placed my order 2 minutes ago. I can't wait until it arrives in the mail so I can listen to the full version!